Near-infrared (NIR) laser sources (800–1000 nm) can potentially reduce the processing time for curing by a fast heating and incorporation of NIR absorbers into the coating. The latter converts NIR laser light absorbed into thermal energy. 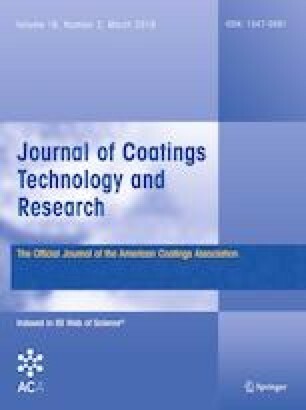 This curing technique was successfully applied to one-component thermoset coatings based on blocked polyisocyanate/hydroxy-polyester and melamine formaldehyde/hydroxy-acrylate resins with heptamethine cyanines as near-infrared absorbing material. The laser curing was additionally compared with LED sources. In general, the curing time significantly decreases in comparison with traditional heat sources. Furthermore, the photopolymerization of acrylates or epoxides can be induced simultaneously by adding suitable initiators due to photochemical generation of radicals and cations. Curing of the thermoset resin system and the photopolymerization process created interpenetrating networks. Principally, the techniques reported based on photonic NIR sources may help to substitute oven techniques where thermal activation of curing reactions is typically induced by oven or heating with infrared radiators for coating applications. This paper was presented at the 2018 European Technical Coatings Congress on June 26–29, 2018, in Amsterdam, The Netherlands. The online version of this article ( https://doi.org/10.1007/s11998-019-00197-3) contains supplementary material, which is available to authorized users. The authors thank the county of North Rhine-Westphalia for funding the project REFUBELAS (Grant 005-1703-0006) and FEW Chemicals GmbH for the NIR sensitizers.